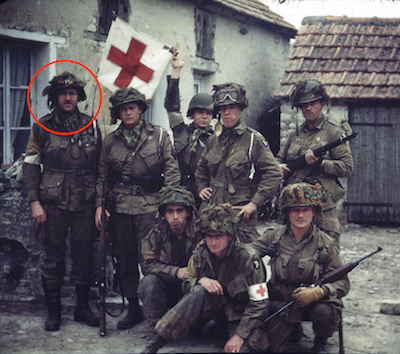 George Lage was a Battalion Surgeon with the 101st Airborne 2/502nd Pathfinders. His daughter and son in law, Brenda and Alan Mitchell, have made available letters Doc Lage wrote to his wife about the D-Day landing which I reproduce here. Photo courtesy Dr. George H. Lage and the Lage Family. This is the last letter I’ll be able to write for a little while. I will write again as soon as I can. I’m enclosing two clippings from the Stars & Stripes the other day to give you some idea of how important the higher ups think we are. Darling, please don’t give up hope or worry if you get another ‘Missing in Action’ report like you did once before, because I’ll be home with you before too long. I’ll have to condense the rest of my story into a few lines and expand upon it later. The morning of June 7 about 6 A.M. more gliders came in and a couple crashed near us so we went out to pull them out. Sixteen men were killed outright and several others injured so we had our hands full. We gave them plasma right there as we pulled them out, bandaged their wounds, and sent them off to the hospital for treatment. We worked until 11:30 A.M. then went back, got something to eat and began to pack up to move as all the Germans had been cleared out and tanks and infantry from the beach landings had come in and relieved us. We found out where our Regiment was, got a hold of several horse carts and horses and packed up all our ammunition and supplies. I had the jeep and a trailer with all my medical stuff in it. We set off in a caravan for our outfits. We arrived about 4:30 P.M. and set up in an orchard where the rest of our outfit was. We stayed there until about 8 P.M. and then moved about 2 miles to protect the Division Headquarters. It was very quiet that nite. 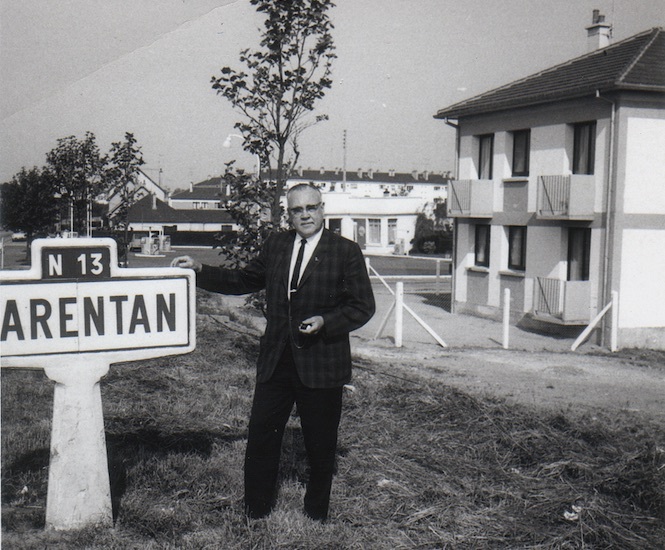 The next morning we moved out to another area, cleaned it out and stayed 2 nites and then we moved back and attacked the town of Carentan. We had a very hot, vicious battle but succeeded in driving the Germans out after 20 hours. We then pulled back after being relieved, spent that nite and the next in a rest area, then we went into the attack again and drove the Germans out into the swamps about five miles away. We had a lot of casualties in the first battle of Carentan so we really had our hands full. We called it “Bloody Sunday” as that was the day of our big fight. Medically, we gave lots of plasma and treated lots of wounds. The medics did a very wonderful job of picking up wounded, treating them, and evacuating them to the hospital. We really made our reputation that day and from then on we weren’t called “pill-rollers” any more, but were called the combat medics. Several medics received decorations for the job they did under the most trying of conditions. The second time we went in we had a lot of medical work but nothing to compare to the first time. After that we were moved to a rear area to mop up, clear the area of Germans and mines, etc. During the time back there we ate 5 in 1 rations which were better and had more variety than K-rations. It was back in this area that Capt. Willard Jarvis found me. We had some good visits together and he either came down or I went up to see him. We drank a couple of bottles of rum to celebrate and really had a good time while there. He is still there and evidently going great guns as near as I can tell from the papers. We were then moved to an area near Cherbourg for a while as a rest area and to clean out the area. Then we were brought back here for replacements and reorganization. Now anything can happen. You just never know where I’m going to turn up next! The war is endlessly fascinating for me. I was born in Berlin ten months before the breakout of the war in September 1939. I was raised in wartime Hungary. My earliest memories are of war. It’s like a slideshow of disjointed images. I was too young to understand and to be scared. It was only as an adult that I understood how lucky I was to come out of it alive. As an adult I also understood that had it not been for the Allies I probably would not have survived, my brother didn’t. I owe these men and women a huge debt of gratitude. Last updated June 9, 2016.